We’d love your help. 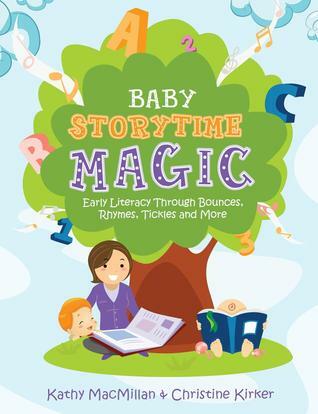 Let us know what’s wrong with this preview of Baby Storytime Magic by Kathy MacMillan. To ask other readers questions about Baby Storytime Magic, please sign up. Probably the best Baby Storytime resource I've read so far. Great ideas for what to do for storytime, along with easy-to-understand literacy tips and explanations. Great resource of rhymes and storytime goodness. has some cute rhymes with scarves, etc. This is an excellent resource with so many easy to learn (and remember) cute rhymes, fingerplays, tickles, etc., specifically geared towards babies. It's great for those just starting out, as well as those that need some new material. Lots of great ideas for a traditional baby storytime (meaning that each baby is participating with their parent or caregiver). There's enough theory to learn more about development and the role of literacy for newborns up to 1-2. I used this book primarily for the list of good baby storytime titles. Very useful with a great range of rhymes, songs, and literacy points. One of my favorite professional collection books! Tons of great lap rhymes and other ideas for baby storytime. Meh. I like the list of books to use, but the songs and rhymes were very blah. I don't think I'd use any of them.